Search Results for "dog bowl"
1960s: Dog sits in dog bed. Boy empties dog food into bowl. 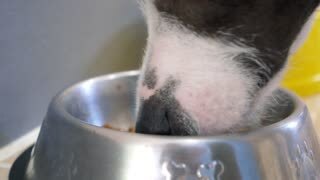 Boy pours warm milk over dogfood in bowl. Dog yawns and jumps from bed. Boy places bowl on floor. Dog eats from food bowl. 1950s: Dog wags tail, eats from bowl. Dog runs up driveway, other dog stands on sidewalk. 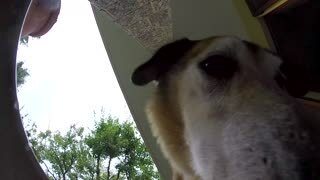 Boy calls dog. Dog wags tail and barks playfully. Toddler reaches through picket fence. Boy waves stick. Upview from the bottom af a dog's water bowl while the dog is drinking. 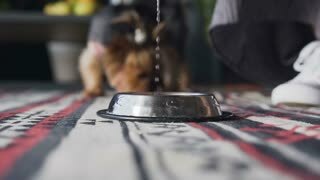 Cinemagraph - Dry kibble dog food is poured into a bowl. Dog looking on bowl . Living Photo. Dog water bowl in street with dog hydration sign. UNITED STATES 1970s: Lady Brings Bowl of Water Out of House for Black Dog to Drink. Lady Sits on Back Door Step as Dog Drinks from Bowl of Water. Man Works Inside Factory Room on Machinery. Pet food falls into the bowl for feeding. Dog looking on bowl . 1950s: Boys walk with dog on leash. Hand opens tap. Bowl fills with water. Hand closes tap. Boy brings bowl with water to the dog. Dog drinks water. The two boys enter house. 1950s: Boy sits on steps of house with two dogs. Boy kneels on sidewalk petting shaggy dog. Dog lays on grass chewing bone. Man places bowl on grass, dog approaches. Man and dog play with ball. 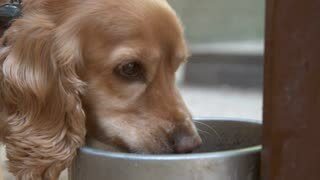 Dog drinking water from the bowl. Man feeding her dog water with bottle. Beautiful Australian shepherd puppy 10 months old at autumn park outdoors. 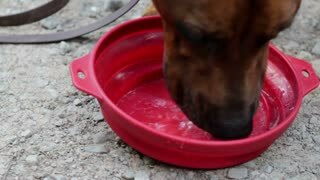 Cute hungry Dog breed Labrador Retriever Drinking Water from Bowl. Happy adult dog enjoy dinner at home. Pet Animal and Nutrition. Cute hungry Dog breed Labrador Retriever Eating Dry Food from Bowl. Happy adult dog enjoy dinner at home. Pet Animal and Nutrition.